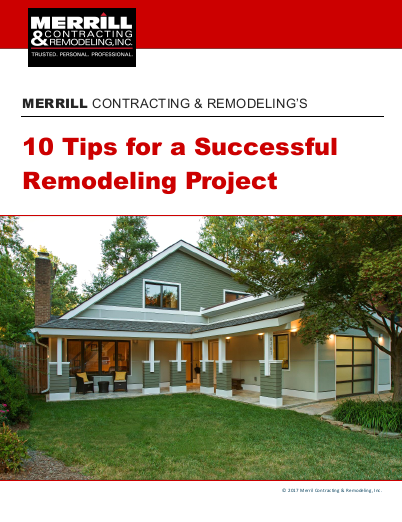 Merrill Contracting & Remodeling is a design build home remodeling contractor and custom home builder known for professionalism and personal commitment to our clients’ satisfaction. To meet today’s highest home remodeler standards, we invest in attaining and maintaining key residential remodeling industry and environmental certifications. Since 1994, Merrill has been a National Association of the Remodeling Industry Certified Remodeler, a certification awarded only to individuals who have been actively involved in the remodeling industry for at least five years and have demonstrated a strong commitment to the professionalism of the remodeling industry and to his or her business. In addition to Certified Remodeler status, David Merrill is also a past president of NARI’s large and active Northern VA Chapter and continues to play an active role in NARI. Merrill’s lead carpenter has been with the firm for years and holds NARI’s Certified Lead Carpenter status. The certification recognizes the achievement of hands-on field personnel who have attained the management skills and experience to oversee every aspect of home remodeling projects to ensure safety, compliance, communications, craftsmanship and customer satisfaction. Merrill Contracting is an EPA Certified Renovator for Lead Safety. We have been trained and certified by the Environmental Protection Agency to perform renovation projects that may disturb lead-based paint in homes built before 1978. We use lead-safe work practices including containing the work area, minimizing dust and cleaning up thoroughly to prevent lead contamination.